I was making eggs last Sunday and something occurred to me – the idea of Sunday eggs. You need to know that I eat eggs almost every day of my life. A couple of cage free organic local eggs, over easy, quickly gobbled up before rushing out the door, the plate left for the dogs to lick clean. But on Sundays, well, the pace is slower, I feel more relaxed, and it’s the perfect time to make something a little more special. 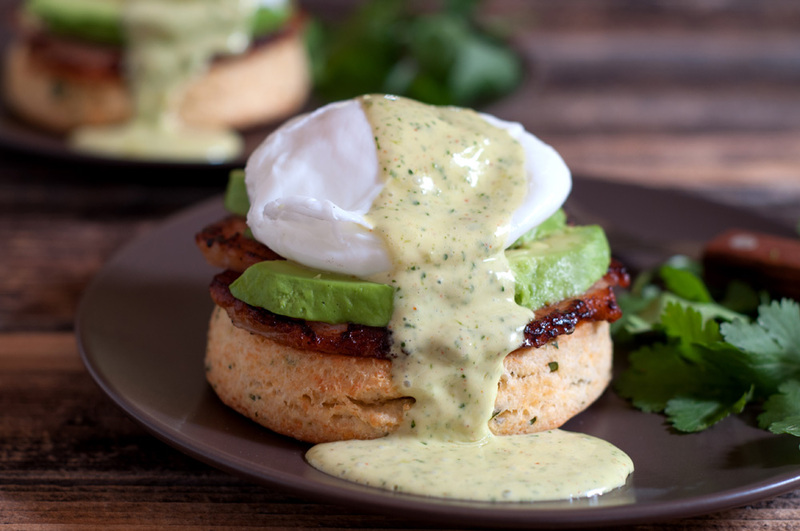 Something mouth-watering good like this Benedict recipe. I created this recipe for Niman Ranch recently, to showcase their fabulous Canadian bacon. The recipe includes shortcuts for making the biscuits ahead of time, and a technique for making poached eggs the day before just in case you decided to serve this for a football or holiday brunch. And with distinctive Southwestern flavors, it feels exactly like a Colorado recipe should to me. You’ll find the full recipe here – hope you enjoy it!